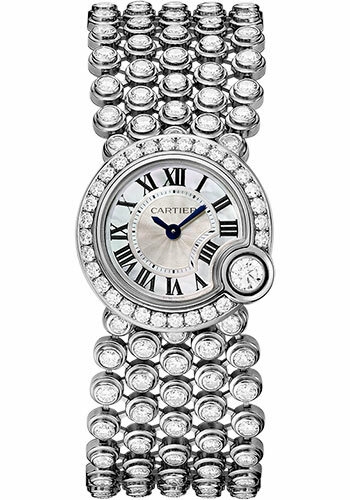 24.2mm 18K white gold case set with brilliant-cut diamonds, 8.44mm thick, 18K white gold bezel set with brilliant-cut diamonds, sapphire crystal, mother of pearl dial with solitaire diamond nestled into the curve of the dial, quartz movement, mother of pearl bracelet with paved bubble. Water resistant to 30 meters. 24.2mm 18K white gold case brilliant-cut diamond at 4 o'clock, 8.44mm thick, sapphire back, 18K white gold bezel brilliant-cut diamonds at 4 o'clock, sapphire crystal, mother-of-pearl dial with brilliant-cut diamond at 4 o'clock, quartz movement with blued-steel sword-shaped hands, 18K white gold bracelet. Water resistant to 30 meters.